Raymond Collishaw was born in Nanaimo, British Columbia on November 22, 1893. When WWI started he tried to enlist in the Royal Canadian Navy, however, he heard nothing from them for some time. Having attended a flying meet at Lulu Island near Vancouver, and hearing that the Royal Naval Air Service was hiring, he decided to apply for them instead. He applied in Esquimalt, B.C. and then was sent to Ottawa, Ontario for a final interview. He was enrolled as a Probationary Flight Sub-Lieutenant and would become a full one upon completing a flying course. At his own expense! 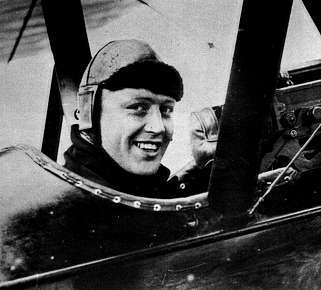 He then travelled to Toronto to attend the Curtis Flying School, the only flight training school in Canada at the time. The candidates waited a long time to get into the school, throughput was slow and the weather was getting cold and would soon curtail flying. Due to the destitute condition of many of the RNAS "students" the Royal Navy decided to give them basic naval training in Halifax and then ship them to England and have them do their flight training there. He did his basic training on the cruiser HMS Niobe until January, 1916. It was then that he boarded the White Star liner Adriatic for England with a bunch of other Canadians, including Lloyd Breadner, who was to become the RCAF's Air Chief-Marshal in WWII. He was posted to the naval air station at Redcar for what passed as flight training. Despite problems with landings Collishaw soloed with only 8.5 hours of flying time. Collishaw made some serious mistakes. Once while attempting to deliver a note from a mate to a local girl he crashed into a row of outhouses, covering himself in excrement and toilet paper and destroying the plane. The girl was not impressed. He received his wings and was posted to 3 Naval Wing, a bomber wing flying Sopwith 1½ Strutters as one-seater bombers and two-seater fighter scouts. He participated in the first strike on the Mauser Arms Works at Oberndorff, Germany. His duty was as a pilot in a two-seater fighter-scout as cover for bombers. On one, supposedly, easy flight he was ferrying a Sopwith 1½ Strutter to their new base at Ochey without a rear gunner. He accidently strayed over the front and was jumped by six Albatros DIIs. The first hint he had of their presence was tracer bullets slamming into his instrument panel, one hitting his goggles and partially blinding him with glass. In despiration he dove for the trees hoping to lose them. One Albatros followed and crashed, another cut in front of him and presented a point-blank target. Collishaw didn't miss and sent him into the ground with an accurate burst. Now he had to get home without instruments and nearly blinded. He guided his way home by the sun and landed, gratefully, on a field. Men came running to his plane, he thought to help him. That is until he saw a line of Fokkers on the field. He had landed at a German base. Quickly he gunned the motor and took off with Fokkers behind him and clipped two trees at the end of the field. They caught his slower plane and riddled it with bullets, but he managed to lose them in clouds. He was several miles past the front before he realized it and managed to land at a French airfield near Verdun. He stayed several days to have his eyes patched up by a local doctor. The French were so impressed with his feat that they awarded him the Croix de Guerre and the British posted him to an all fighter squadron. The war was nearly over, but Collishaw persisted in attacking enemy aircraft, almost getting shot down in October, 1918. He was ordered to report to the Air Ministry in London, and three weeks later the Armistice was signed. He was officially credited with 60 kills, however, that doesn't take into account the 8 balloons he shot down. Balloons were frequently more hazardous to attack than fellow aircraft due to the defensive arms and supporting aircraft they had around them, but for some reason they were not credited as an aircraft kill. Collishaw claimed that he downed 81 aircraft and balloons. Had be flown for the RFC this total would have been closer to his credited kills than 60, as the RFC was more lenient in awarding kills to pilots. In the RFC Raymond Collishaw would have been the highest ranked ace of the war, and would undoubtedly have been awarded the Victoria Cross. Many pilots in the RFC were given the VC for efforts less heroic or hazardous than many of Collishaw's, but the RNAS pilots were definately second-class when it came to awards. Collishaw was nominated twice for the VC but had them downgraded to DSOs. In July, 1942 Collishaw was recalled from the desert and was replaced with Air Vice-Marshal Coningham. He was given the a posting in Fighter Command in Scapa Flow, Scotland. This was considered to be a "peaceful" posting where aviators could unwind from long periods of front line duty. Certainly Collishaw needed it. By this time the Luftwaffe had other problems in Europe and did not bother with raiding Scapa Flow. Ray Collishaw was retired from the RAF in July, 1943 with the rank of Air Vice-Marshal, this was not a unanimous decision, as in his autobiography he used the term "was retired from the RAF". It isn't likely that this old warrior would have voluntarily retired in the middle of a war. Still he soldiered on as a regional air liaison officer with the civil defence organization until the end of the war. Following the war he returned to British Columbia as part owner of a mine near Barkerville. He finally settled down to a good, and finally, peaceful life. He died in West Vancouver in 1975 at the age of 82.